BEHOLD, I AM KNOCKING AT THE DOOR! The Christine Car Club » Non Automotive Off Topic Section » CCC Fellowship In Christ » BEHOLD, I AM KNOCKING AT THE DOOR! Look! Jesus is knocking at the door of your heart and of my heart. He doesn't come in unbidden. He is courteous and only comes if invited. In Holman Hunt's famous painting "The Light of the World," there is no handle to be seen on the outside of the door to make that very point. 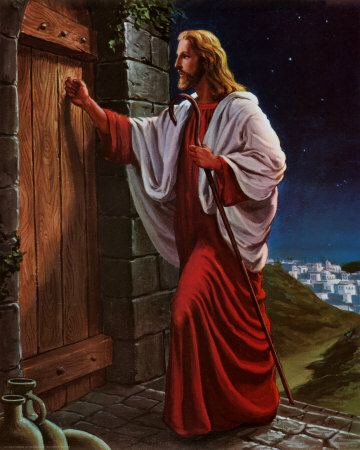 If we open the door at His knocking, He promises to have fellowship with us as He had fellowship with His disciples. A large part of Jesus' time with His friends was spent in table fellowship over a meal, so much so that His critics called Him a glutton and a drunkard. In His parables, Jesus describes the Kingdom of God as being like a great banquet (Luke 14). We are promised a foretaste of this Great Banquet when we open the door of our hearts to Him. The fact that God Himself wants to have this close intimacy with us is staggering. Many of us will remember the thrill of encountering the Lord in this way when we first opened our hearts to Him. May we never lose the immediacy of that close fellowship even as time goes on. INSIGHT: AS FOLLOWERS OF CHRIST WE CAN EASILY RELAPSE INTO A COOLER, FORMAL ROUTINE IN OUR RELATIONSHIP WITH HIM...IN OUR DEVOTIONS, PRAYERS AND BIBLE READING. JESUS SAYS IN REVELATION 3:16, BECAUSE YOU ARE LUKEWARM - NEITHER HOT OR COLD - I AM ABOUT TO SPIT YOU OUT OF MY MOUTH! SO LET'S OPEN THAT DOOR AFRESH...AND IF YOU HAVEN'T OPENED IT AT ALL OPEN IT WHILE YOU ARE ABLE TO.